At the PLA National Conference, I picked up an advance reading copy of a new book from Milkweed Press. It is Shopping for Porcupine: A Life in Arctic Alaska by Seth Kanter. It is Seth's second book, the first was a novel. He is a photographer and writer whose work has appeared in many publications. It is partly a memoir, and partly a reflection on how life on America's last frontier is changing. His parents moved to rural Alaska and lived in an earthen igloo when he was born. There are great stories about his growing up years and his adventures. There are some very touching stories of the native people, and the values and skills he learned from them. There are great photos in the book, many of which he took. [In the ARC, the photos are in black and white, I can only imagine how great they will look in color. The publicist for the book has told me that they are in color in the final copy. Reading the book brought back a poignant memory for me. When I was about 12 or 13, I met a young man who was growing up in Alaska. His grandparents lived down the street from my family (in Central Massachusetts), and their son came back with his wife and kid for an extended visit. Remember that in the 1960s, it was a very big deal and long trip to go from central Alaska to Central Massachusetts. I don't remember his name. What I do remember is part of what Seth reflects on his his book. This kids was socially pretty awkward. (Yes, even compared to me.) He was easily overwhelmed if there were more than a couple other kids around. (I have seven younger brothers and sisters and grew up in a suburban neighborhood during the Baby Boom. There were *always* lots of kids around.) It has also made me reflect on the differences between how I grew up and how my kids grew up. Besides a difference in environment, the sheer difference in demographics is incredible. On the street I lived on with my kids, they were among the few young ones for most of the time. There were one or two other children, but the neighborhood had not changed yet from the older owners to the younger ones who are there today. Anyway, I recommend the book. It is a fascinating read and offers insight into a far corner of our country. 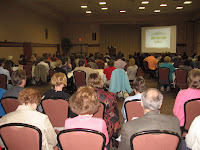 I posted to both this blog and to the WLA Blog for this conference. Here are the posts, in chronological order, linked to each. I don't usually read USA Today, but that is one of the perks of staying at the Holiday Inn. Yesterday's paper (5/1/2008) had a couple of articles worth commenting on. There were economic stories on the front page which received comment at yesterday's WAPL program on the economic impact of libraries. The Fed dropped the interest rate again (and it did not help the stock market yesterday). Air travel costs are going up. That is not good news, especially with my need to visit family, and travel for the ALA conference. I am glad I have most of my tickets locked in. Then there was the story about college tuition. The headline was, in my opinion, very misleading. It caught my attention partly because David Ward yesterday showed a slide which dramatically showed the lifetime earning impact of having a college education. The headline seemed to be saying that was not true. However, that is not really what the story was saying. There was a report recently which showed that most of the increases in college tuition do not go to directly supporting the teaching of students. That is incredibly different than the headline! I guess for me, the good news is that for private, 4-year institutions the cost increases (as a percentage) were smaller than public universities or community colleges, and that the proportion going to direct student education costs was higher than the public universities and community colleges. I guess it is just media at work! I came in late, so I missed the introduction. There was a panel whose members took turns showing new items. They used a del.icio.us page (which is linked here). This is an add on for Firefox. It will let you block ads from specific advertisers. It has options and settings, but it will also let you "whitelist" a page so that the ads show up. If you are a fan of Pandora, this will let you search for and listen to one specific song (which Pandora does not allow). You do not have to create a playlist because it sets a cookie. It also lets you see the video. Has all sorts of info on technology as it relates to higher education. Takes everything where there is a feed and puts them in one site. It will keep track of what you do on various social networking sites. You can use it to RSS feed items. A way to promote upcoming local author events. Anyone can add events (if you have a Library Thing account). You can also subscribe as an RSS Feed. It also keeps track of favorite venues and events. Is a way to find a mutually convenient meeting place. You can choose parameters like coffee, need chocolate, at a library. Lets you create widgets, customize a little, and then you can cut and paste a bit of code to paste on your site/blog/facebook/etc. Will let you check to see if a specific web site is working or if you are having a local problem. It is very graphical and lets you drag stuff on to a specfic page to save. It is something which is downloaded on to your machine. Takes every hot site you do not want in your RSS feed reader and lists them on a single page. It gives you an idea of what is going on. The original Bloglines got "old and tired." The presenter said that it has all the benefits of both Bloglines and Google Reader. [editorial note: I *hate* Google Reader.] She really liked it. I may take a look, but she had disparaging remarks about Bloglines. It is an easy way to access the Google docs from within your web browser. It is a way to create a spontaneous chat session. It is important to choose a name which is unique. This is a "sad and pathetic" excuse for readers advisory. It seems to have a science fiction and fantasy bent. Aims to be the Pandora of reading. This is similar to Rosetta Stone. It adds a community of learners who can offer tips. Quick definitions are listed here. Includes logos and tags of new items on the web. Since YouTube is blocked in most schools, this lets you get info out to teachers. Lets you highlight sections on a page, and then send a link to the highlighted page. Let's you store your online accounts and passwords. Lets you generate all kinds of buttons for your page. Lets you keep your history, cookies, bookmarks, and saved passwords across several computers. It does need to be added, and works only with Firefox. Finds sites similar to the ones you are on. It is based on tags on tagging sites. It will work not just with web sites, but with articles. They need to have been tagged. This is a site for getting free stock photos. It includes items which cost also. It is a radio site. It has any kind of song you want built into a channel. You can even build your own channel (but only if you use IE). High quality music. This is a way to make your own page to feed in all of your social networking site. You can arrange the page however you want. Lets you send yourself "hassles." Twitter is a social networking that uses very short messages. This sends a message twice a day which is the first line from a book, as a teaser. Let's you choose a web site and (for fun) put different disasters over a web site. This site lets you create an organizational chart and print it and save it. Has authors talking about books. It can easily be embedded in web page. your dad's email totally made me cry in the middle of the computer lab today. thanks a lot uncle jimbo! yeah, me too. it's nice to think of it that way, cause it's so true. but I agree with Calvin, just because she lives in us, doesn't make it any easier to deal with the fact that she's not out there in the world anymore. well, I don't know...just having a hard time with it today. One of the things I have learned this winter and spring is the importance of sharing personal feelings and I am glad to both see their comments, and see that their comments reflect my feelings. As I was getting ready to blog the last WAPL program, I got to chatting with Lisa Strand, the WLA Executive Director. After we chatted, she said, "Oh, I should invite you to the WLA Blog." Well, even as I was blogging, I got an email inviting me! I have signed up, and will cross-post. Actually, I will probably put most of the additional programs on the WLA Blog, and post my personal comments here (with a link from there). One of my brothers-in-law sent this note out to the family today. I'll post the PDF file, if I can figure out how, or you can email me for it. I get a daily Calvin & Hobbes cartoon on my Google home page. A couple weeks ago, there was one about a baby raccoon, where Calvin said "You don't get to be Mom if you can't fix everything just right." I thought you Moms and all of us, as children of a Mom, might appreciate that. As the days went on, the story of the raccoon developed into one of sadness as Calvin dealt with the mortality of the little raccoon. It made me think of Nancy when he said, "Don't die, little raccoon. It wouldn't be very grateful of you to break my heart." It sounded like something Nancy would have said when she was little. When the raccoon died in the comic strip, it was the day of Mother's funeral. Calvin's Dad said, "At least he died warm and safe, Calvin. We did all we could, but now he's gone." And Calvin replied, "I know. I'm crying because out there he's gone, but he's not gone inside me." That sure hit home, and I thought it was very well put. The series ended with Calvin saying, "Mom says death is as natural as birth, and it's all part of the life cycle. She says we don't really understand it, but there are many things we don't understand, and we just have to do the best we can with the knowledge we have." I put the strips together to share with you, if you're interested. I hope this message doesn't offend or upset anyone, but I thought the way the comic dealt with death was both touching and cute, and it made me feel better. He talked about the "new economy" and the importance of regional organization and thinking. He talked about the New North, and other joint planning efforts including Momentum (which includes Eau Claire). It is important to set the context by talking about the four economic trends highlighted in his main speech. He offered slides for use to libraries who are making the presentation. There are so many things happening in the world today that people are confused. His income gap slide (which shows family income by educational attainment) shows the critical role for libraries which support people's acquiring a better standard of living. From 1976 to 2000, real family income (that is adjusted for inflation) has decreased for those with less than high school education and only a high school education. Economic multipliers are acquired from various sources some are often available locally. Be careful to not overstate your case. Libraries are not an economic engine. First mission is to provide services. But....public libraries are in important part of the new economy. The last point may be the most important and includes not only the collections by the value of the people. Public libraries are a good and necessary investment in a rapidly changing economy. Public libraries are a consistent source of information and technology. They won't be acquired closed down or moved offshore. With an increasing gap in income levels, public libraries level the information and technology playing field. A growing wave of retiring baby boomers will use libraries as a key part of their working and non-working lives. He then went to questions. There has not been a study done of Minnesota. The state economies of Wisconsin and Minnesota were equal in size in 1990, that is no longer true. Minnesota has half a million fewer people. Some think the brain drain is the reason, but that may not be true. However, Wisconsin does not attract "new brains" while Minnesota does. Financial risk-taking has always been greater in Minnesota than in Wisconsin. Wisconsin is a manufacturing state with a guarded mind-set. Minnesota has had a broader vision, and companies like 3M encouraged spin-offs. There is change in Wisconsin, but it is slow. It is important to use the ROI argument in print but verbalize the services argument. The economic multipliers come from the Implan Group in Minnesota (ironically). WAPL is the public library division of the Wisconsin Library Association. Each spring there is a meeting. For me it is a lot like going to the PLA National Conference because it is all programs! 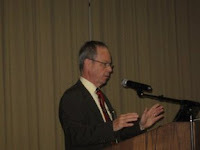 The Keynote Speaker was David Ward of NorthStar Economics. About a year ago the state's LSTA Advisory Committee recommended an economic impact study. NorthStar Economics won the contract through a competitive bidding process. He handed out both the slide show and the Executive Summary of the final report. The session was scheduled to be followed by a breakout session, which is scheduled to be repeated Friday morning. He started with one of his favorite jokes (I have heard him before). "An economist is someone who does not have enough personality to be an accountant." He started with an overview of the current economic situation including the shift from agriculture to manufacturing and now to services. The second shift is in the nature of work. The proportion of work that is "nonroutine interactive" has increased dramatically while "nonroutine manual" has decreased. The analysis was done using the Dictionary of Occupational Titles and the occurrence of skills required. The chart shows types of skills base-lined to 1960, and graphed them over time. He gave the example of the new economy using Google which is about a decade old, and is already 6 times the market capitalization of Ford and General Motors. He showed the size of the US economy related to the size of other parts of the world. Total world population is 5.5 billion but the US population is only 0.3 billion. The world economy is $48 billion. The US is only $14 billion and the EU is $13 billion. The nature of the economy is shifting rapidly as economic sectors expand and decline. The nature of work is shifting away from manual labor to higher level analytic and interactive skills. The pace of econonmic change has accelerated. The US is an important but shrinking share of the global economy. This was a basic introduction to the study. He held up the USA Today which had economics based stories all over the front page. The study started in October 2007, the report is essentially done, and the presentation was the formal unveiling. There were surveys and focus groups and they reviewed other studies of public library impact studies. He reviewed the basics of impact studies which calculate the amounts acquired from various sources and spent. The model takes the direct economic impact and use the economic multiplier and calculate the "total spending impact." In Wisconsin that is $326 million. This is spending that mostly affects "Main Street businesses." A second part is jobs: there are 3,222 jobs, but another 3,058 jobs are created by the spending from people in the first set of jobs for a total of 6,280 jobs. They also looked at the market value of services provided by libraries. He presented a chart which I will need to analyze more before talking about it. However it is included in the full report. They assigned values to materials, the value of a reference transaction, computer and Internet access (which has been consistently undervalued in prior studies -- Kinkos charges $0.30 minute), and then for programs. The total was $750 million which he advocates saying is 3/4 of a billion dollars. After discussing the preliminary results they added values for meeting rooms, career and job info, periodicals and subscriptions, electronic databases, specialized materials, and wi-fi access. The best way to present the data is to talk about things like economic impact per capita. The key message on the ROI is that the annual return for each dollar of public tax support is $4.06. The value of libraries is particularly evident in rural and low income areas. Libraries are a central community gathering place and are very valuable. Electronic access to library is critical (example of picking up requested items). Even in the Internet Age it is important to maintain the physical facilities and maintain a knowledgeable staff. It was a great summary of a report which will play a huge role in promoting the value of libraries in Wisconsin.